The Cyber Security and Privacy Research Institute (CSPRI) has received a $30,000 contract from Texas A&M University that will enable Texas A&M to use GW’s online cybersecurity scholarship application system to support its new cybersecurity scholarship program. GW will provide support, guidance, and consulting as appropriate. This work has the potential of being replicated at many institutions that must assemble and evaluate materials and ultimately decide who the winners are of cybersecurity scholarships. Dr. Costis Toregas (CSPRI) directs this institute and Dr. Lance Hoffman (CS) is the founder. Dr. Muhtar Ahart (research scientist, CEE) has published the following paper: T. Yamanaka, Y. Nakamoto, M. Ahart, and H-k Mao. “Pressure dependence of electron density distribution and d-p-π hybridization in titanate perovskite ferroelectrics,” Physical Review B 97, 144109 (2018). The work is supported by CDAC (Carnegie/Department of Energy Alliance Center) and EFree (Energy Frontier Research in Extreme Environments) at GW. Dr. Kausik Sarkar (MAE) has published the following paper with Ph.D. students Mitra Aliabouzar and Krishna Nandan Kumar: M. Aliabouzar, K. N. Kumar, and K. Sarkar. “Acoustic vaporization threshold of lipid-coated perfluoropentane droplets,” The Journal of the Acoustical Society of America, 143, 2001-2012. On April 18, Dr. Sameh Badie (CEE) and Khalid Alsadhan, CEE senior, attended the annual student awards reception sponsored by the National Capital Chapter of the American Concrete Institute (NCC/ACI). Khalid received the 2018 NCC/ACI Student Award for his academic achievements related to reinforced and pre-stressed concrete structures. 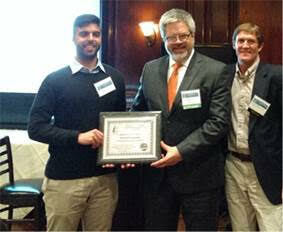 The award was presented to Khalid by the ACI president, Dr. David Lange. 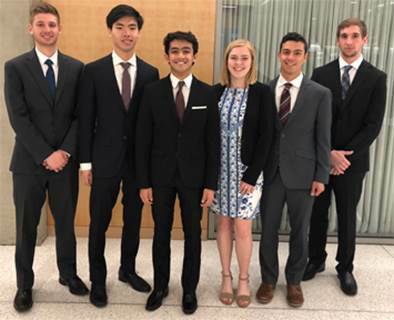 Rem Houghton (ECE) and his teammates John Kuhl (GWSB) and Samuel Bamiboye won the Audience Choice Award at GW’s 2018 New Venture Competition. Their venture, Bendt, is a distributive-risk mitigation platform that facilitates the trading of future earnings of professional athletes to produce tracking stocks. BME senior Tania Singh won an award for her poster “Ultrasound-induced Insulin Release” in the Basic and Translational Research category at the 8th Annual Children’s National Health System Research and Education Week. Tania’s research advisor is Dr. Vesna Zderic (BME).